My sister is a huge fan of potatoes, she can eat them whichever way they are served and she’s completely happy. And I, even though I also like potatoes, love yuca or cassava even more. The first thing I eat whenever I’m served a plate of sancocho or stew is the cassava. I love the texture and the flavor, very different to any other root vegetable. 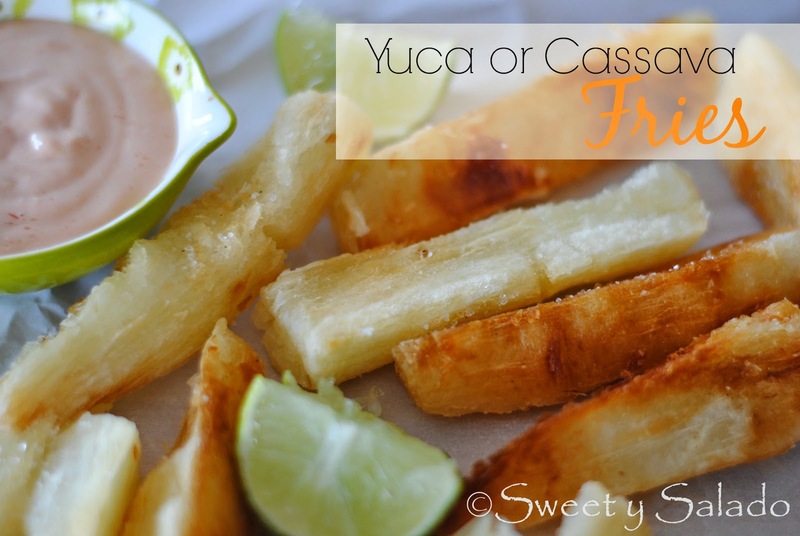 Fried yuca or yuca fries is a dish that is very well known in many Latin American countries, Colombia being one of them. It is often served as an appetizer with lime wedges and any kind of dipping sauce such as pink sauce, garlic mayo or guacamole. It is also served as a side dish especially with fish or pork. It does take a bit more time to make because you have to boil it in water first and then fry it, but the final result is delicious and so worth it! 1. Place the cassava in a medium pot and cover it with enought water. Add the garlic and season with salt to taste. Cover the pot and bring it to a boil on high heat, then, lower the heat to medium low and cook for about 20-30 minutes or until it’s tender. 2. Drain the cassava and let it cool on a cutting board. Once it has cooled, pat dry it with a paper towel and cut it into thick pieces, similar to steak fries. 3. 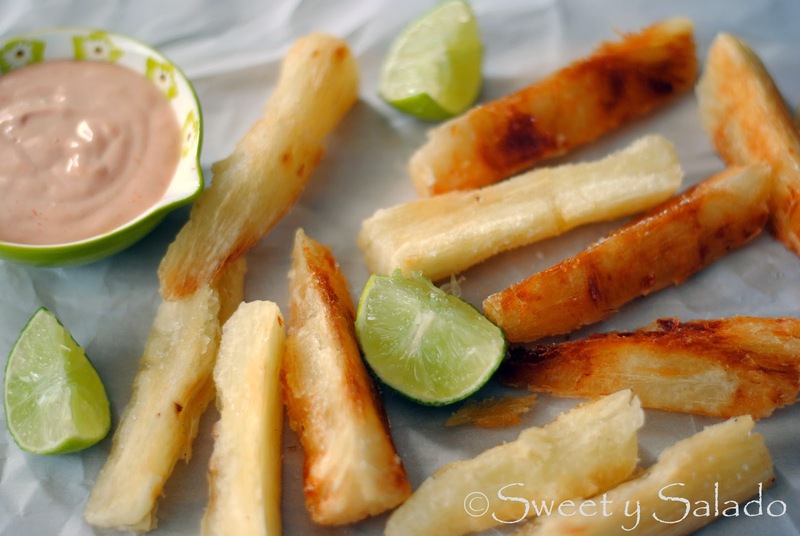 Fry the cassava pieces at 375ºF (190ºC) for about 5 minutes or until they’re golden brown. Then, take them out of the oil and drain them on paper towels. 4. Season them with salt to taste and serve immediately with lime wedges and any type of dipping sauce of your choice such as pink sauce, garlic mayo, ketchup or guacamole. **Tip: Cassava has a thick string in the middle which you can remove with your knife before boiling if using fresh cassava. When using frozen cassava you can remove it with your hands after it has cooled after boiling.